On the trail at BOSS, your poncho is a raincoat, ground cloth, tent, wind break, bivvy sack, water collector, blanketpack protector, etc. - an all around excellent item to have with you and an important item to select carefully. 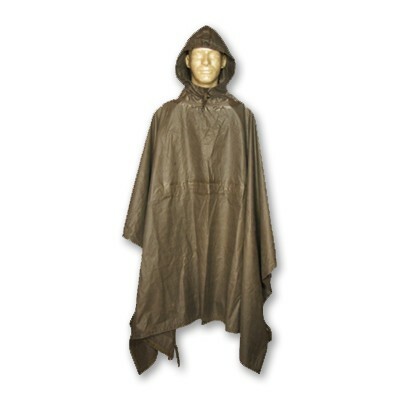 This medium-weight, rubber coated poncho has a seam-sealed hood and drawstring closure to keep water from running down your shirt when it gets stormy. Heavy-duty snaps along both sides make it functional as a bivvy sack or to join it with another poncho for a two-person shelter. Reinforced edges with heavy-duty grommets also allow you to tie it down as a tarp or suspend it as a fly. These are the real deal - military surplus, not newly manufactured. We strongly urge you to consider investing in a quality poncho.